I don’t know about you but I’m not even close to finishing all my Christmas shopping! I have to admit that I’m a major procrastinator when it comes to holiday shopping. There are just so many fabulous options out there that I have a hard time deciding what to get everyone (and trouble resisting just buying it all for myself). If you are in the same boat as us, don’t worry. We’re ready for you! 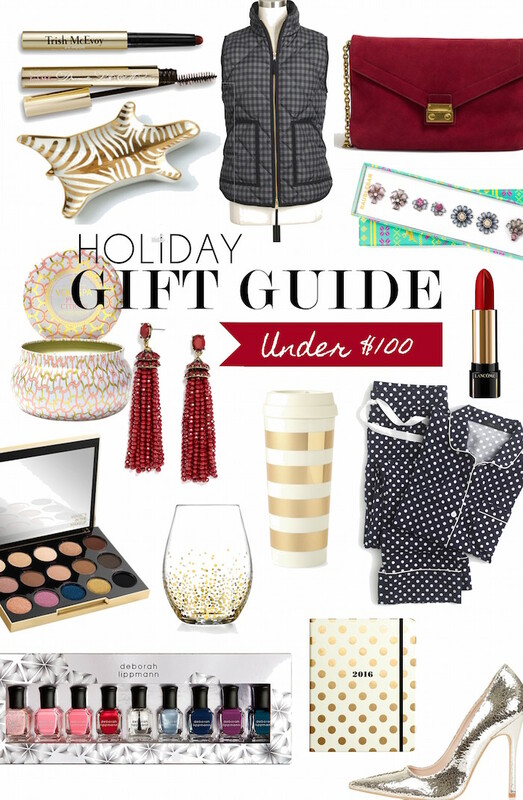 We’ve put together the ultimate holiday gift guide for her, everything under $100! We’ve selected gifts that every woman would love including haute fashion picks, beauty loves and even items for the home! Truly something for everyone. Is there a beauty junkie in your life? If so, she is going to love this Gwen Stefani eye shadow palette collab with Urban Decay. It features 15 shades for only $58! Get her ready for the mistletoe with this Lancôme Lipstick in a vibrant red (very on-trend this season). Don’t forget about the eyes with this Trish McEvoy Eye Duo which includes her 24-Hour Eye Shadow and Liner Glamorous and Dramatic Lash Mascara. For your most fashionable friend I’ve selected a couple items from one of our favorite jewelry stores, Baublebar! This tinsel studs gift set has four pairs of studs to add just the ring amount of bling. Formerly $112 but now a steal for $58! There is also a stunning pair of tassel earrings we’ve been coveting! Tassels have been EVERYWHERE lately! One of our fave picks, this J. Crew Puffer Vest that is only $49.95 – talk about a bargain! And you’ll be tempted to get these gold heels for yourself. She can curl up in these comfy polka dot pajamas and sip on some hot cocoa in this super cute Kate Spade Thermal Mug. For that friend who is the ultimate hostess we have these lovely stemless wine glasses which would be perfect for New Year’s Eve! And finally this zebra tray is the stylish piece to adorn your dresser and put your jewelry in. Wishing everyone a very Merry Christmas and happy shopping! By shopping through the links in this gift guide for her and other KSW gift guides, you help KSW and our contributors earn a small commission. Each time you do, it allows us to do more here and make this space just a little bit better for everyone. Thanks so much for your support! Great job Tori!! Looking for a final gift that WOWS for less? 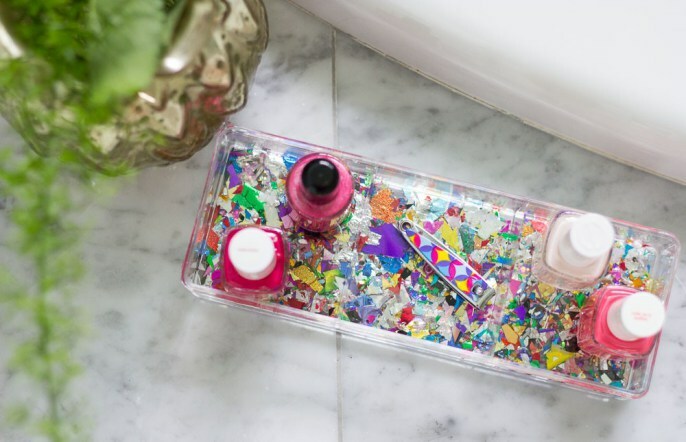 Head over to the sTORIbook to find out how to make these gorgeous DIY confetti trays!!! They make excellent gifts for teens and tweens, but I know tons of friends who would flip for one too. Throw a couple fun colored bottles of nail polish on top, wrap in some tulle and tie with a pretty bow and you’ve got yourself the perfect gift for not a lot of money at all. Even better, gather the girls together for a craft night and make these while you spend time some down time together during this hectic time of year. Then, wrap and gift to someone special. We hope you enjoyed this holiday gift guide for her, click here to find more KSW Gift Guides. And if you need help finding gifts for someone in particular or have a relative who is super hard to shop for. Let us know! We’d love to help you find the perfect gift. Tori is an editorial stylist and fashion and beauty blogger at The sTORIbook, where she eamlessly intersects her impeccable style and edgy sophistication. Tori was named San Antonio Fashion Blogger of the Year and has worked with a bevy brands including Neiman Marcus, H&M, Nordstrom, Lancome, Target, and many, many more. In 2015, Tori was also named one of Neiman Marcus’ Women Who Rock.